What's the common link that joins 1) telecom giant Singtel; 2) Singapore Airline, reckoned by some to be the world's best-run airline; and 3) the DBS Group, the largest bank in Singapore? First, they are all, obviously, Singapore companies headquartered in the tiny island nation. Equally important -- but less known -- they all share a common shareholder: Temasek Holdings. Temasek isn't a household name in this part of the world. And with good reason. For years it has been a secretive behind-the-scenes player backing Singapore's companies and helping to turn them into regional powerhouses. It has been a super-secretive organisation that never released its annual report for public scrutiny. Its investments and returns were always closely-guarded secrets. But all this is poised to change. With assets of over $59 billion Temasek is now aggressively spreading its wings and heading to other parts of Asia. And India has been identified as one of its key markets for its venture capital activities. Take a look at the action. Last week, Temasek finalised a deal with Hyderabad-based Matrix Labs. Temasek is picking up 7.73 per cent in the pharma outfit for $38.4 million, in conjunction with US-based Newbridge Capital, which has picked up a similar amount. Once the deal is over the two companies will also make an open offer to buy an additional 20 per cent in the pharma company. Temasek also controls telecom major Singapore Technologies Telemedia (STT), which is believed to have bid for AT&T's 33 per cent equity stake in Idea Cellular. That's not all. Temasek has strong linkages in the banking and financial sector (it controls DBS) and it's putting its financial muscle into ICICI Bank. Back in December Temasek quietly took a 5.26 per cent equity stake in the bank. Since then it has moved unobtrusively and upped its stake to 9.26 per cent. Temasek is reckoned to have put about $250 million into the ICICI deal. That makes it one of the largest deals by an international private equity company in this country last year. Says Eva Ho, director, Temasek and the group's official spokesperson: "Our investment in ICICI is driven by commercial attractiveness and fits in to our interest in investments in banking and financial services." Temasek's hunger for new investment hasn't been sated by the ICICI deal. In the pharma sector it has picked up 5.46 per cent in penicillin-maker Aurobindo Pharma for slightly over $20 million. The investment has been made through the $100 million Merilon India Fund which was floated last year jointly between Temasek and Standard Chartered Private Equity. The fund aims to invest in Indian companies in any field -- except infrastructure, real estate and trading. Says Ho: "The fund aims to provide capital for Indian companies that aim to expand their business within India and beyond and also in regional companies seeking opportunities in India. The fund will focus on mid- and late-stage companies." It's clear the low-profile Singapore company means serious business. In the last six months Temasek has already invested or committed over $400 million in Indian companies. And that doesn't include the cash it has invested indirectly through group companies like Singtel. The Singapore telecom company has forked out over $650 million to buy 28 per cent equity stake in investment in Bharti Televentures. Says a senior banking source which has observed Temasek closely: "They take time to understand the market. But once they move in they do so with aggression." How does Temasek compare with other leading venture capitalists in the country? Warburg Pincus, which has been around for much longer has invested over $785 million (according to a Nasscom survey covering a period till December 2003). Nasscom says that the Singapore government (which includes Temasek) is number two. ChrysCapital has made total investments in India of around $217 million. And our own homegrown ICICI Venture has invested over $500 million. So what explains the new thrust into India? And what is Temasek's strategy for investment? Temasek is cautious about revealing specific details but it has, for the first time, talked about the broad directions it will take in the future. Basically, the company is bullish about Asia and also about India. So, in the last few months it has taken over two Indonesian banks and bought a 5 per cent stake in Telekom Malaysia. And it has identified key areas where it will throw its main firepower -- banking, health care, telecom and education. These sectors, it believes, will ride on the back of an economic recovery and the emergence of a strong middle class. Says Eva Ho: "We want to deepen our connection with India as part of our wider interest in Asia. A key thesis of our investments in India would be the promising companies with distinctive intellectual property, world-class competitive strengths and scaleable potential to expand regionally or globally." The Singapore company has already put together a three-pronged strategy for investment in the country. One, it will take a different posture or view from the company it has invested in and will occasionally invest in competitors. Says Eva Ho: "In simple terms it means that Singtel's investment in Bharti would not preclude Temasek or other Temasek-related companies from participating in India with perhaps different telco partners." That clearly explains why it may bid for AT &T's stake in Idea Cellular. It would like to broaden its exposure in an attractive sector. Two, Temasek will co-invest with non-Indian companies which want to grow in India. It might also invest jointly with these companies in other third countries. Temasek is tightlipped about such moves. But there are several possibilities. For instance, US-based Quinitiles (in which it has invested) is the world's largest provider of clinical trials. The company may set up base in India to service the pharma industry. Then, there's CapitalLand, a Singapore real estate major (with interests in shopping malls, housing, office space etc) controlled by Temasek, which has shown interest in India. Three, and this is crucial for Indian companies -- Temasek wants to put money in companies that have the capacity to become international players. Says Eva Ho: "We may invest with Indian companies which have potential to scale beyond the domestic market to reach Asia and the world." Indian companies are already looking at ways to turn the Temasek connection into new businesses. Says C Ramakrishna, executive vice president, Matrix: "Temasek has invested in several biotech and pharma companies across the world and there is a strong possibility for Matrix to take advantage of this situation wherever business synergy fits in." Matrix, for instance, is looking at possible cooperation with Temasek Life Science Laboratories which does research in molecular and genetic areas. The company might also look at setting up a R&D centre in Singapore to leverage the relationship. Ramakrishna also points out that Temasek has links with many US based pharma companies -- and alliances with them are possible. Temasek may have similar plans for Aurobindo Pharma. "Aurobindo represents a key pharmaceutical sector investment for Merlion India. With its strong chemistry skills and cost advantage, Aurobindo will soon be able to transform itself into a global generics player," says Karam Butalia, managing director, Merlion India. Adds P V Ramaprasad Reddy, chairman, Aurobindo Pharma: "The induction of a strong long-term partner such as Merlion India demonstrates the company's positioning in the investor community." In fact, Temasek has always looked at global linkages when making its investments. Take a look at what happened to EGInnovations -- a specialised software company which got its initial funding from a Temasek incubation programme. Says Srinivas Ramanath, the Chennai-based president of the software company: "Through Temasek's network we got contracts in Singapore from top companies like Singtel and the Ministry of Defence. Also it provided us a test market for our products in an advanced market before we bootstrapped to the US." Today, 60 per cent of EG Innovations' revenues come from Singapore where it has its Asian headquarters. Temasek is, of course, foraying to foreign shores so that it can keep up the high returns on investment that it has always given shareholders. Temasek, for instance, declared recently that it has given shareholders a 16 per cent compounded return for the last 30 years. Say an analyst who watches the company closely: "That kind of return might not be possible in the new future, so the company has to willy-nilly look at emerging markets and emerging areas." Analysts say that in India returns of over 15 per cent to 20 per cent especially in pharma, banking and retail are not tough even if investments are made at a late stage. Early stage investors can expect to earn up to 30 per cent on investment. 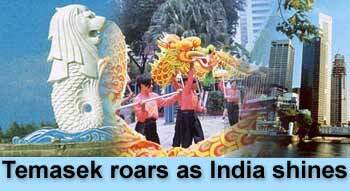 Temasek's India strategy could be dependent on external factors. There are, for instance, the free trade agreements (FTA) and economic cooperation agreements that are shaping up between the two countries. Many Indian companies, especially in auto components, chemicals and agriculture, are opposed to the FTA. Says a senior executive of the Automotive Component Manufacturers Association: "While our goods can in any case be exported duty free even today into Singapore, there is a risk that we might be swamped by auto components from Singapore into India." But Temasek has other reasons for wanting a free trade. It is, for instance, keen on encouraging Indian companies to list on the Singapore stock exchange. Temasek executives say this will give companies like them an opportunity to invest in Indian companies. Talks are already on between Indian exchanges and the Singaporeans for closer linkages. Then, there's the vibrant debt market in Singapore where Temasek is again a key player. Temasek executives say that the recent relaxation of ECB (Euro-Commercial Borrowings) limits by the Reserve Bank of India will make it easier for Indian companies to tap the Singapore debt market. How does Temasek's India strategy compare with what it is doing in China? Says a close watcher who has been associated with Temasek in various projects: "On a scale of 100 their interest in China is 70 and that of India is 30. They still think India is slow, not moving at the same pace as China plus there are cultural affinities which you cannot wish away." Adds a merchant banker: "I think they have missed out on the IT and BPO space which has been a key sector here." Eva Ho says that Temasek doesn't have any direct investments in China currently. However, companies owned by it like PSA Corporation, Keppel Corporation, SembCorp Industries, and CapitaLand have extensive operations in the Middle Kingdom. There have, inevitably, been criticisms that Temasek has occasionally got it wrong. The company for instance three years ago launched inCube -- an innovative incubation programme with Chennai as one of the centres. Start-ups were offered seed capital, office space and management services. But inCube discontinued operators in 2003. Eva Ho says the operation was too small and Temasek has changed its focus. But whatever the reason, Temasek is betting the big bucks in India. And with a new office being set up in Mumbai to oversee the Indian operations, the quiet and secretive investor could take everyone by surprise. In India such cosy relationships would probably be frowned upon. But in Singapore they are the norm. So, nobody bats an eyelid, when the island city's largest venture capital fund (established in 1974) is backed by the country's finance ministry. What does Temasek not control in Singapore? That's a tough one to answer. It has a finger in every pie from airlines, banking, real estate, ports, power, media , hotels and even the famous Singapore Zoo and the night safari park. The listed companies in the Temasek group represent over 20 per cent of the Singapore stock market's capitalisation. There have been critics who've said that the close relationship with the Government has stifled entrepreneurial drive and has prevented a much-needed shake up. Temasek vigorously denies such allegations. Observers say that 's changing now. Stanford educated Ho Ching who took over as executive director of Temasek two year ago is pushing for a more open policy and an aggressive drive into the Asian market. And she is capable of making a difference because Singapore's power equation are in her favour -- she's the daughter-in-law of senior minister Lee Kuan Yew and wife of his son Finance Minister Lee Hsien Loong. Under her stewardship Temasek has decided to become more transparent: the company has decided to publicly disclose its annual report with details of its performance this year. That would be unheard of just a year ago when its investments, returns and strategies were all veiled. The move come close on the heels of the company's plans to go in for a $3 billion bond sale sometimes this year. And observers say the new carefully calibrated strategy to be more transparent fits in with the company's need to open its books to an external rating agency for a credit rating before it goes to the market.